Billy Elliot is a musical based on the 2000 film Billy Elliot. The music is by Elton John, and the book and lyrics by Lee Hall. Mr Hall also who wrote the film's. The musical premiered in London in 2005. One of the most award-winning shows on stage to date, Billy Elliot the Musical has won the hearts of millions since it opened in London’s West End and has gone on to captivate audiences around the world. The show is set in a mining town in County Durham, Northern England, against the background of the 1984/’85 miners’ strike. Billy Elliot is the inspirational story of a young boy’s struggle against the odds to make his dreams come true. Follow Billy’s journey as he stumbles out of the boxing ring and into a ballet class where he discovers a passion for dance that inspires his family and whole community and changes his life forever. 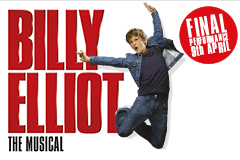 Featuring a timeless score by Elton John, sensational dance and a powerful story, Billy Elliot the Musical, winner of the 2013 Olivier Audience Award, is a funny, uplifting and spectacular theatrical experience that will stay with you forever. The current Billy Elliot cast includes Olivier Award winner Ruthie Henshall as dance teacher Mrs Wilkinson. The production includes the now classic songs such as ”Merry Christmas, Maggie Thatcher”, “Born to Boogie”, and the dramatic final scene of Billy Elliott, dancing the lead in Tchaikovsky's "Swan Lake" as his overwhelmed father watches his son's triumphant debut. Outside of the London's West End, Billy Elliot the musical is now showing in many cities accross the world, including New York, Sydney, Chicago, Toronto and has toured acrross the America. For the fans, a scheme called Billy Youth Theatre was created as part of which schools and youth groups can have the opportunity to stage their own production of the show. Writer Lee Hall, together with Martin Koch, have adapted the original script and orchestrations to produce a shorter version of the show for groups staging local productions of Billy Youth Theatre. 3 hours 20 minutes. Monday - Saturday at 7.30pm, Thursday and Saturday matinees at 2.30pm. Like the film, Billy Elliot the Musical contains strong language and some scenes of confrontation between policemen and miners. We want to make you aware of this when booking a ticket. As a rule of thumb, when booking tickets for parties including children, please consider the film version of Billy Elliot (rated 15) and whether this would be suitable for all members of your party. Ms Henshall will NOT perform on a number of Tuesday performances - please ask for further details. The recommended minimum age for content is 8. A fast moving interpretation - good visual demonstration of the many, often conflicting, areas of Billy's life. Loads of bad language - I wouldn't like my children to hear it (ages 8 & 13). The show was absolutely amazing! These kids were outstanding!